*Graduation day!! My family gave me a hard time, but I had a very well-constructed agenda of the day’s events I had sent to them so they knew who needed to be where and at what time. Paul and I left early to park Christy’s car near the Kibbie Dome so it would be easily accessible when we left graduation. That was number one on the day’s agenda. *It was Travis and Jason’s job to get to the Kibbie Dome early and secure us some good seats. Since Jason was still not feeling well (more on that later), Travis ventured out in the morning, walking to campus and securing us excellent seats. He even made Snapchat videos to send us to make sure he was choosing the correct area. What a guy!! *Paul dropped Christy and I off at the Kibbie Dome at about 8:30 a.m. We found Travis and got situated. Paul joined us soon after he parked our car. And eventually Zoe, Molly and Taylor joined us as well. We were right up at the top of one of the sections, and had a great view of Cosette as she marched in with the other graduates. Perfect seats!! *The Commencement Speaker was St. Maries native Tom Mueller, a U of I grad (Class of 1985, same as me!!) who is an engineer and works with the Space X program (you can read more about that here). He shared with the students some of his thoughts, such as believing Mars will be inhabited in their lifetime. He also believes that computers will develop human intelligence. And he told the students to not settle and take risks in their life. Their biggest problem could be their own self doubt. *And then the big moment came, as we saw Cosette walk across the stage to earn her diploma. She received a Bachelor’s of Science Degree in Broadcast and Digital Media. 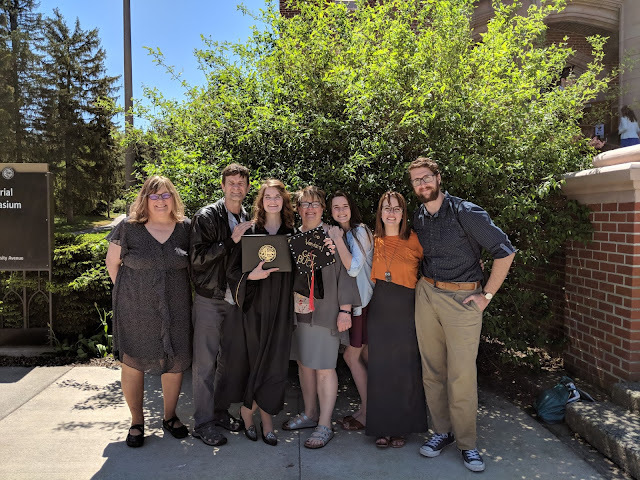 It was thrilling to have her attend my alma mater, and now join Paul, myself, her Grandma Mary, her Aunt Christy, her Aunt Laurie, and her Uncle David as U of I alum!! *After the ceremony we went over to Memorial Gym to enjoy a nice reception for the College of Letters, Arts and Social Sciences. Our dear friend Kenton Bird, who is an associate professor at U of I, visited with us for a while. When Cosette first started at U of I, she worked in Kenton’s office for her first year as part of her work study job. *I haven’t mentioned yet what a absolutely beautiful and glorious day it was in Moscow. The sun was shining, it was in the 70’s. The weather couldn’t have been more perfect. *After the reception we all gathered back at Jill and Vince’s house so Cosette could open presents, and I got to open my Mother’s Day present as well. *Then it was off to Pullman to enjoy a celebratory dinner at the South Fork Public House. It was a perfect choice for dinner. We all enjoyed our food, and it was a really nice place to eat. *Before we went to Pullman for dinner, Jason went to the hospital and ended up in the Emergency Room. He has been having back pain and throwing up for most of the day. They did a CAT scan and it looked like he had some issues with his colon. But they stabilized him and he ended up coming back to Rinaldi’s house with us and spending the night there. Poor guy!! It is no fun to be traveling and being sick at the same time. *Part of the day that was also fun for me was the other people I knew who were graduating. Some included former Gear Up students from KHS like Raine Yergler and Matt Langer. Other’s included friends from my sorority who had children graduating, including Janet Hawkins, Jana Payne Long, Kris Wiese Tatko, Dedra Swanstrom, and Barbie Tesnohlidek, to name a few. And some of the friends Cosette has made during her U of I years, including Elna Albano. It was a wonderful, wonderful day of celebration!! !